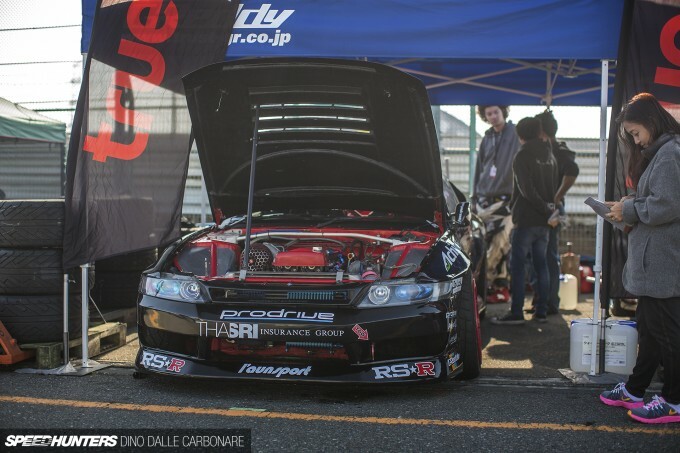 We’re well into spring in Japan and the motorsports calendar is truly coming alive. 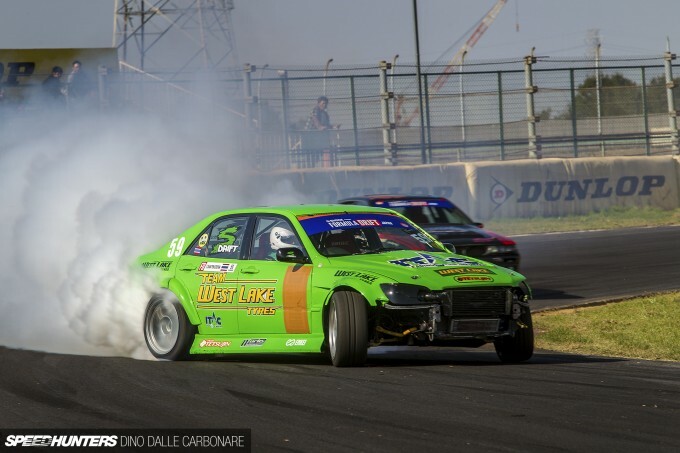 Last weekend it was Formula Drift Japan – the freshest series to come out of the country where the impossibly cool and exciting form of motorsport was originally born. 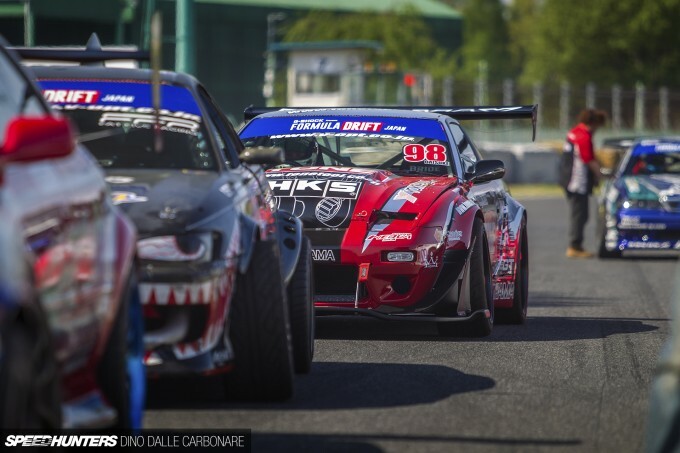 Despite only having a short initial season behind them, the FD Japan organisers plan to continue to grow this new championship, and in doing so attract more drivers from both within Japan and other parts of Asia. And with the 2015 season opener being held at Tsukuba Circuit, I think they are well on their way, as this track has always been a favourite for drivers and spectators alike. 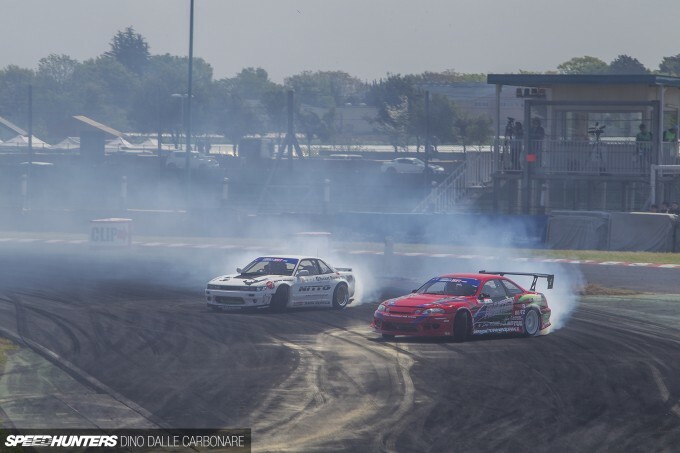 But this time the FD guys picked a totally different section of the track to use and ran it in reverse to promote the higher speeds that this series is known for. 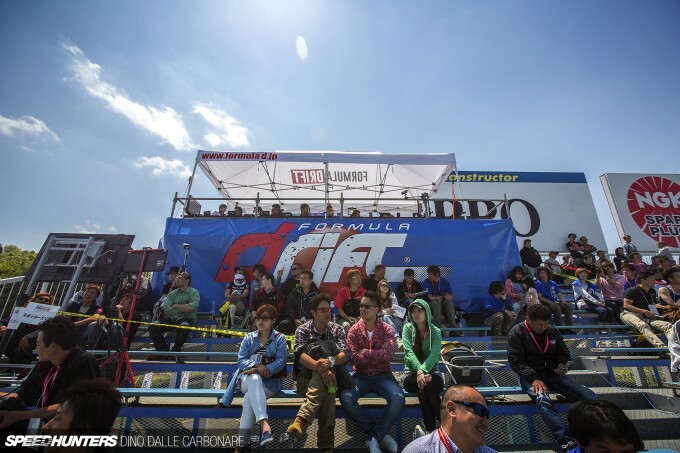 But I’m not here to give you a battle-by-battle summary of what went down, you can easily find that info by clicking on the Formula Drift Japan website link at the bottom of this post. 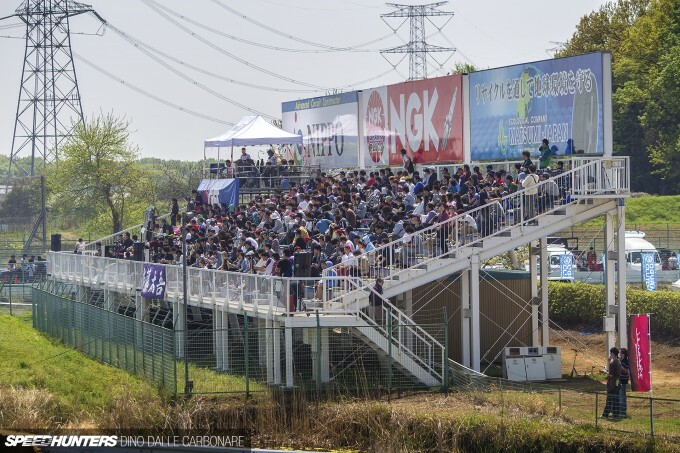 I want to give you a sense of the atmosphere that surrounded this event, as Japan’s best pro drivers battled it out and at the same time helped steer Japanese drifting in the direction it really needs to go. Okay, so now that I have that out of my system, let’s get into it, beginning with the cars. Like any form of motorsport the hardware is at the center of it all, and after this post I’ll have another concentrating solely on the engines bays of the cars that were entered. 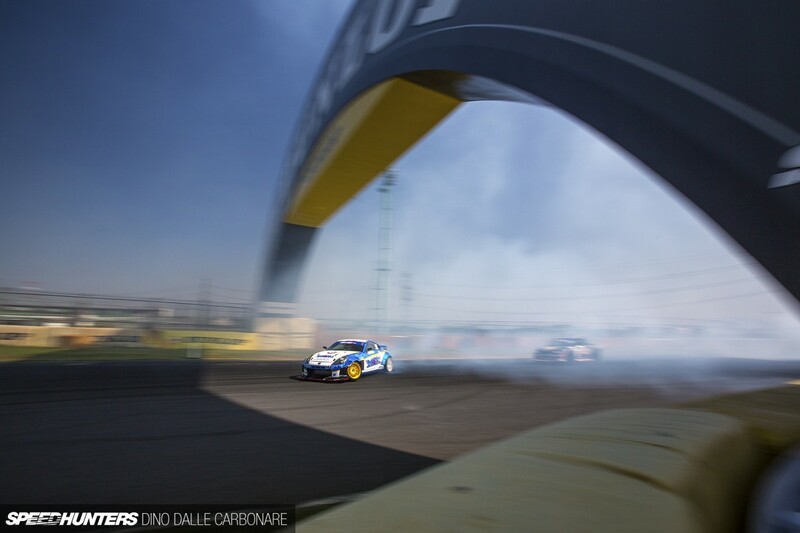 Formula Drift is all about a big show, with big power being a common aspect of the builds. That of course makes for some impressive under-bonnet sights. While V8s rule in the American series, in Japan it’s Toyota 1JZs and 2JZs that are the motors of choice for many. And if your car doesn’t come with either variety of the straight six, then a good old swap will quickly sort things out. One thing that became obvious during my early morning walk through the Tsukuba paddock is that there are more cars competing in the series, which might be down to organizers loosening up the limitations of what drivers and teams can actually do with their cars. Which of course means burning through lots of rubber in as many series as they possibly can! 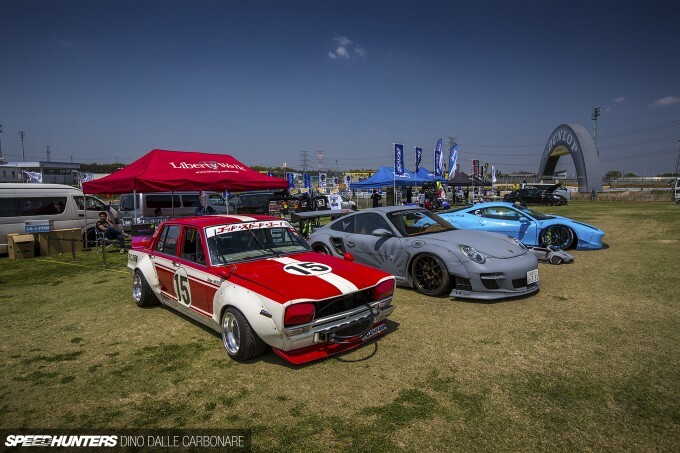 That, after all, is what a drifter’s dream entails, and something that guys like Daigo Saito have shown us is possible when you have the right sort of will and backing. 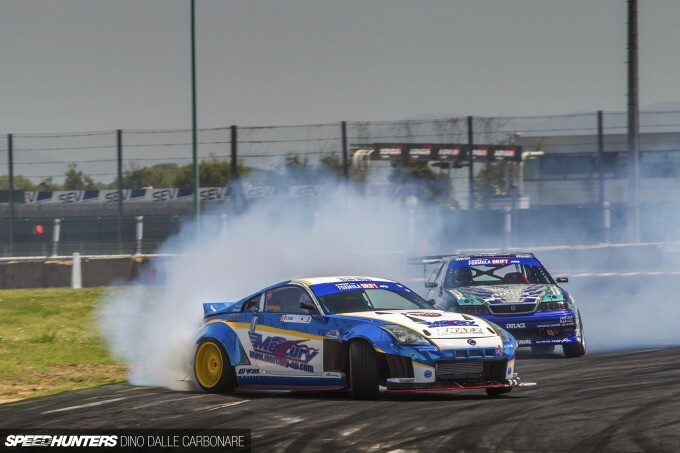 Davide Dorigo and Norachai Chiaravanond from Thailand entered the event with a pair of 2JZ swapped S-chassis machines. Dorigo’s S13 sports a Odyssey headlight conversion and both cars run L’aunsport WRC-style mirrors which I thought was pretty original and looked rather cool. 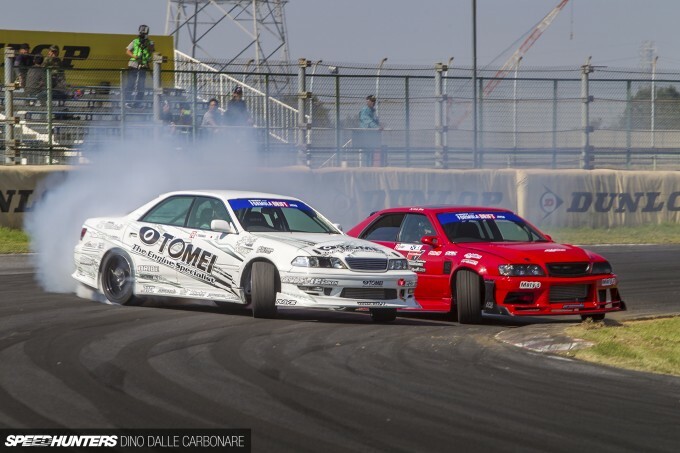 Team Power Vehicles brought out two cars from their HQ inside Ebisu Circuit – Andy Gray’s JZX100 and an all-new build they completed days prior to the event, which was driven by Sheng Nian from Singapore. It was cool to finally see the Mercury Z33 that I recently featured out doing what it was built for – its driver, Noritsugu Totani, using every last drop of the car’s 1000hp. The Nissan looked great and sounded even better. 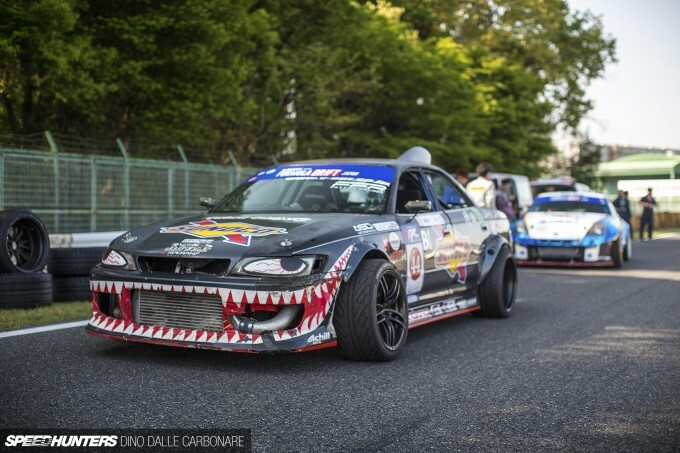 Masuda’s ‘Shark’ looked positively intimidating – its stance and gaping mouth the last thing you’d want to see in your rear-view mirror! While it’s no secret that the car runs some serious power, it seemed to be suffering from a misfire. That was nothing that Masuda seemed to be concerned with though, and he was still using all the engine’s performance to his advantage. Since we saw it a while back at Odaiba, the Toyota has lost its rear bumper but gained smoke-diffusing holes in its rear fender flares. And yes, that is a carbon fiber fin taped to the rear glass. Too funny! It was very cool to see the Tomei Powered name back out at the track, as I don’t think I’ve seen them support a car since they built that crazy drag BNR34 around 15 years ago. We’ll take a look at the engine bay of this JZX100 in the second post I have coming from this event. Here’s another car that I featured some time back, although when we saw it then it looked far more like a street car. 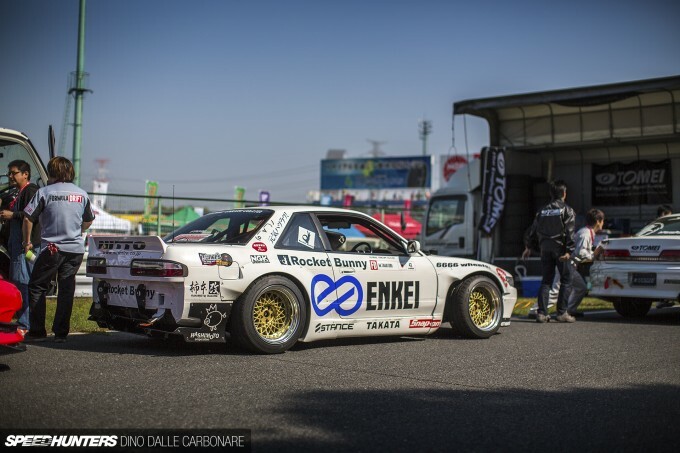 The LS-swapped S13 now runs a full Rocket Bunny aero kit, 6666 wheels by Enkei and a lick of white paint, and is easily one of the coolest cars on the grid. 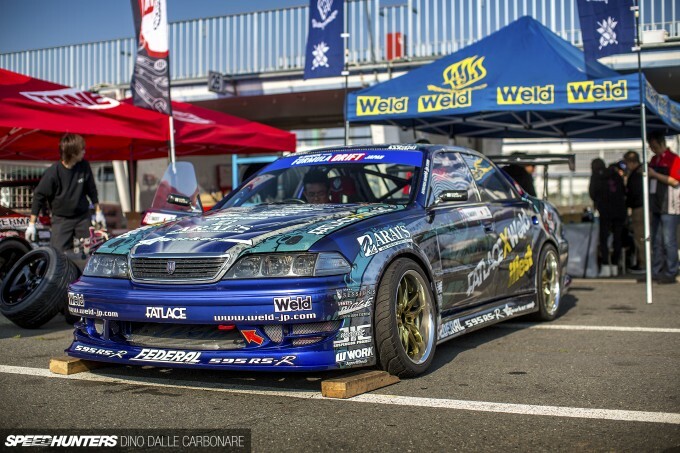 I was really bummed that Saito wasn’t behind the wheel of his crazy JZX100, which we saw at his garage earlier this year. 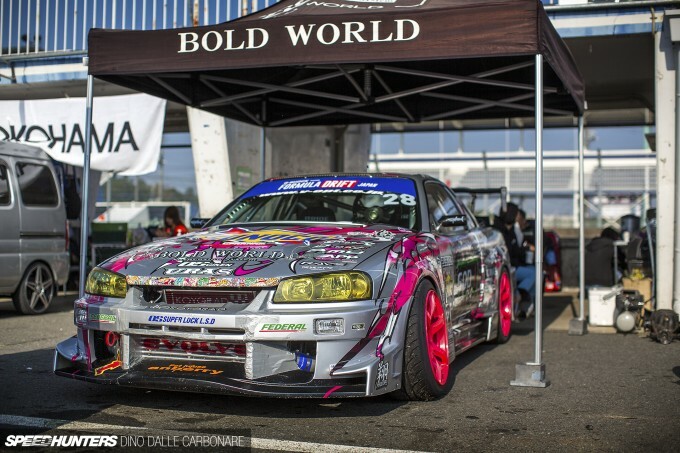 Apparently it no longer complies with Formula Drift regulations, so he showed up with a 2JZ-powered S15 that’s not too far off the spec of his big Toyota. Here you can see him chatting to Daisuke Hasegawa, who over the last months has worked hard at setting up his VR38-powerd BenSopra 380SX. His car is looking positively fresh with a new color scheme. 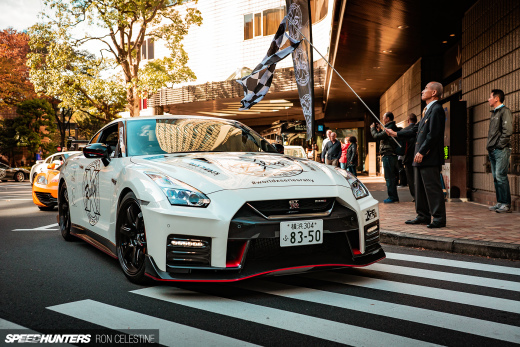 It wasn’t the only car entered that was running GT-R power either – Robbie Nishida was piloting the LiberyWalk/FNATZ R35 we first saw at the Tokyo Auto Salon in January. 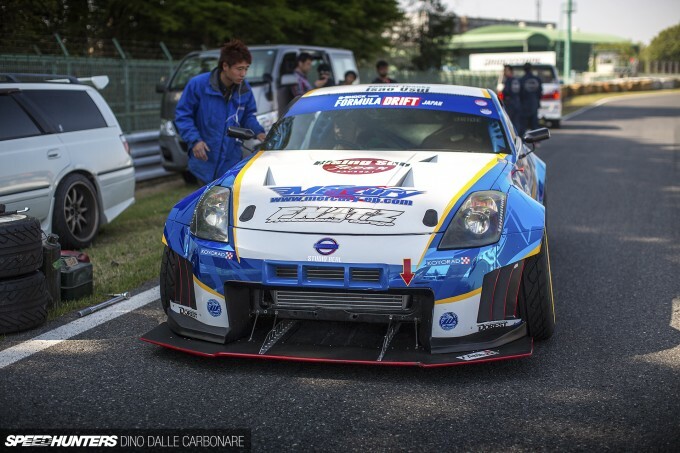 The car looked and sounded great out on track and just wait till you see the engine in this thing – it redefines how the V6 in the R35 should have looked from factory. Well, if Nissan would allow screamer pipe chimneys that is! After hanging around the temporary hot pit at the bottom of the back straight, it was time for the cars to warm up and go out and do their thing on track. Before the competition started I checked out the little booth area that had been set up in the grass section behind the main grandstands. Kato-san at Liberty Walk brought out some cool rides – like his 458 and 997 demo cars – and invited a friend to show off his four-door Hakosuka. The funny thing is, I’m pretty sure I saw the very same car the other weekend in Sagamiko! Wanting to first see what the whole drift section looked like from the judge’s perspective, I sat down under their vantage point and soaked up the action. The hairpin that leads onto the back straight was originally supposed to be part of the course, but it was dropped prior to qualifying on Saturday. By getting rid of the hairpin, drivers could pile on more speed and initiate at this point, which allowed them to carry momentum into the S-curve that leads under the Dunlop bridge. That of course meant they needed to stay hard on the power all the way through the section. With all of this unleashing in front of the main viewing area, the show was happening right where it needed to be. Here’s a wider shot so you can see how long the actual section is. Once the drivers reached this point they needed to set themselves up for the next clipping point. This meant a quick flick the other direction and back on the power as they went under the Dunlop bridge. I was really lucky to get the wide pan under the bridge that I used for the opener in this post as for some weird reason it was prohibited to shoot from there, and a track marshal quickly told me to leave. Here’s another sneaky picture looking away from under the bridge as the cars tightened up their line. This was so that they could hit the last apex, and of course where the chasing car needed to stay glued to his opponent. 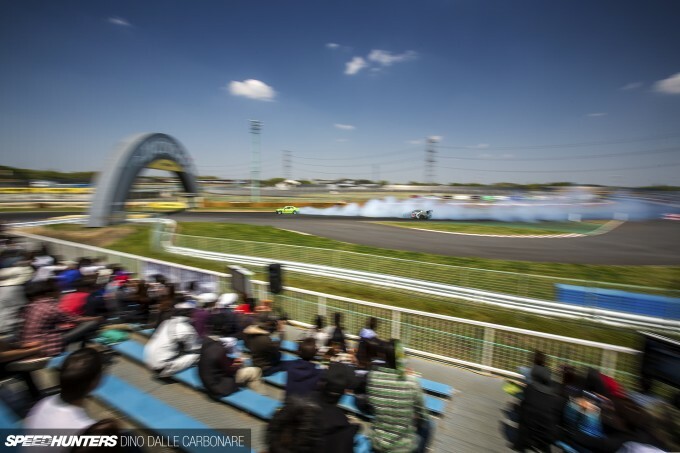 This is what it looked like from the other vantage point on the exit – Daigo Saito maintaining a close chasing line as he battled against Kadekaru’s S15. On this corner exit the lead drivers would really go full-out on the smoke show, as Hasegawa perfectly demonstrates here. 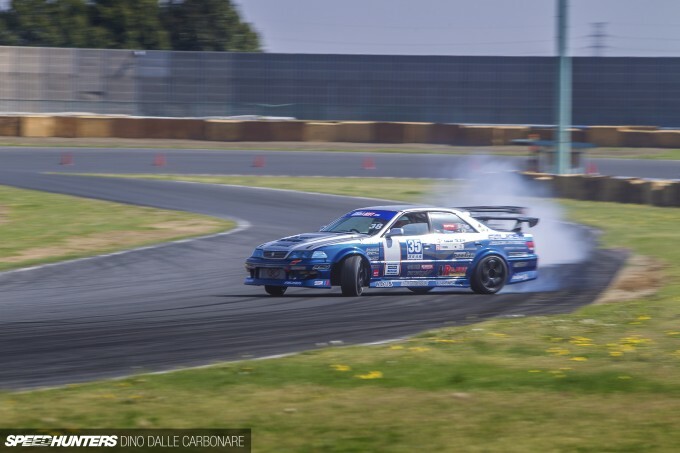 Andrew Gray in his JZX100 wasn’t too far behind when it came annihilating tyres! 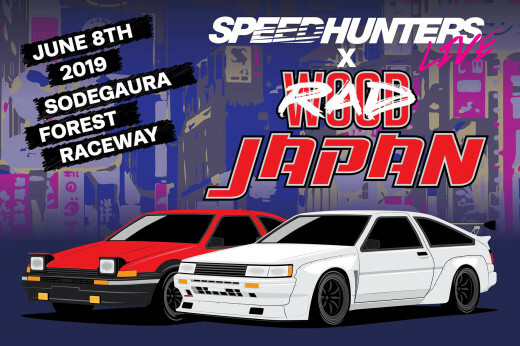 One of the best runs of the day was between Andrew and Yamanaka – a 1JZ JZX100 battle that span over a good hour during the afternoon’s Best 16 runs. That’s because there was some contact and the teams had to take the allowed time to patch up the cars together before going again. More contact occurred in the second run and it was so close to call the judges requested a One More Time. Andy took the win in the end and went straight up against Daigo in the Great 8. All in all it was a great day out at the track. The cars were great, the drivers top notch and the fresh layout at this familiar venue made it all very exciting. There were delays though, and the massive gaps between battles – sometimes as long as 15 minutes – were hard to deal with, as was a constant need for the course to be cleared of crash debris. But it’s part of the learning curve, and putting on an event where lots of unexpected things can happen is never easy. We’ll see how things go in the next round in Fuji in July, but I’m already looking forward to it! Damn, I missed the livestreams for all of the events so far. The track layout was almost as boring to watch as the FD Asia round in Australia. 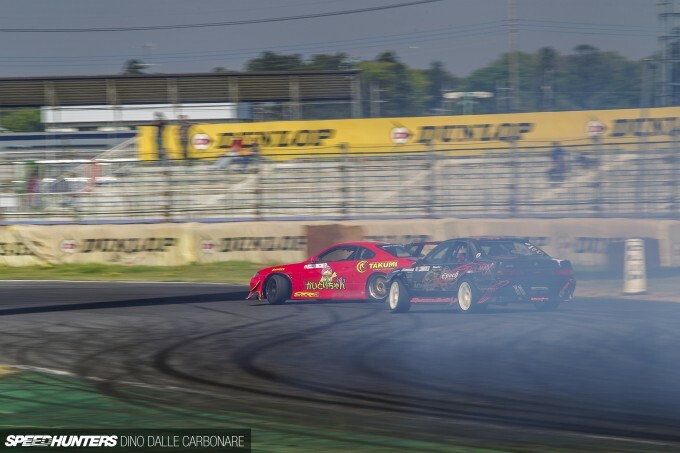 I get that FD is Trying to have a "world championship" but trying to turn every track into 3 or 4 big smoke big power turns isn't a very good way to showcase the tracks and driving styles around the world. They might've well as set cones up around the main straight and manji'd it, this layout is basically the equivalent. Why not run with inside clips only? Let the drivers battle without worrying about willing some outer clip, guarantee the tandems would be better. The only time outer clips are cool are when they're against a wall, inner clips make judging more clear too, they aren't spending 20 minutes trying to figure out if a car dropped one or two tires in the dirt (this applies in a lot of the FD USA tracks as well, look at how good the change in Texas to an inner clip around the sweeper was). Would it really have been that hard to just run the old D1 layout? Or does D1 own the rights to that layout like FD did with palm beach? Overall I was really disappointed by this event, it felt like I was watching a pro am event instead of a professional one. Now I'd like to see Daigo run his Ferrari 430 Scuderia GTE. LOL! jay8393 I think you mean his LBW Murcielago? You referred to Andy as Andrew twice in the post fyi. Great shots! 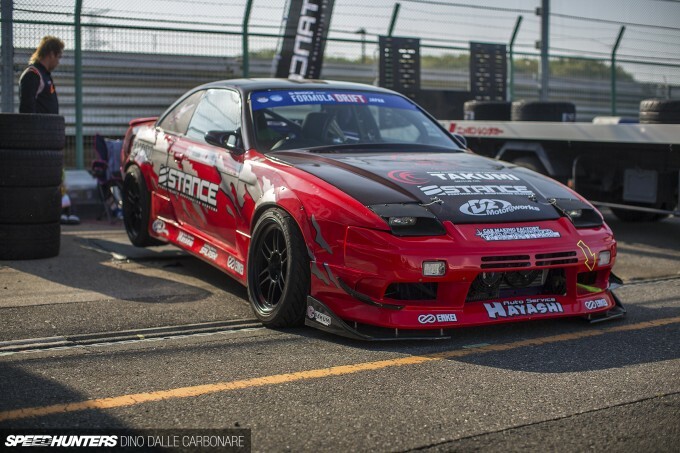 @speedhunters_dino, @crispykrem3, I pretty much agree with what crispy is saying. The section was not that entertaining to watch, at least on the livestream. Maybe it was better in person? It seemed really short, and the transition (most exciting part) was usually blocked out by the bridge due to where they had the camera placed. The start was weird too...lead driver gets inside line with more grip? At every other event, FD uses start chicanes to help prevent gaps, yet here, it seemed the opposite in some runs. Dino, any insight on why they didn't extend the section further past Dunlop to include the infield hairpin? All my complaints aside though, it still had its moments. The cars looks great, many of the drivers laid down some sick runs, and there were some close battles. One thing I did really appreciate was the English translator so I could understand what was going on! MSC uploads it to their channel. The event is split into two parts, 2nd and 3rd videos down I believe. No!!! American trophy truck stance has hit the japanese drift scene too!!! Atleast i still have my sushi! Wait what??? My sushi has cream cheese and avacado??? Noooooooo!!! Atleast i have my chop sticks to eat it with!! What?? Now i have to ask for chop sticks???? Noooooooo!!! I still believe that the Soarer JZZ30 is a better looking car than any other out there. As much as I like FD, this round was a little painful to watch. The start of the layout was messed up by the driving around the hairpin, lead car would create a massive gap that the chase car could barely catch up on. That was a little disappointing for me, as we watch it for the close battles. English translator! Thanks for that! The wait time was painful, but new series etc. Please fix the start line issue, and it'll be amazing! Thanks Dino for the coverage! 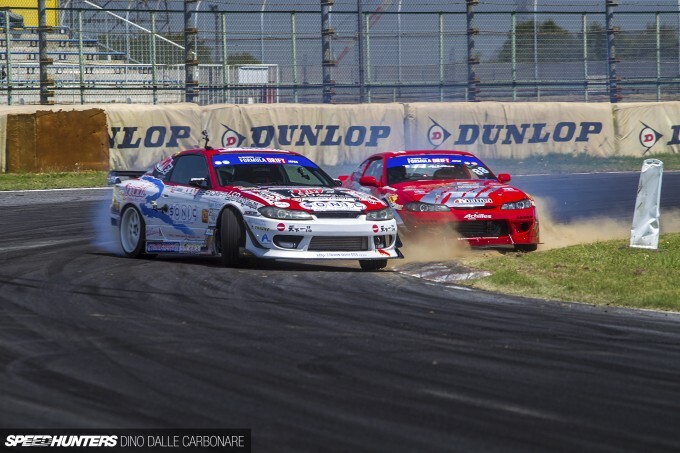 There were rumours on the net about Saito drifting this thing in FD Asia... Don't know how much of it was true though. Twitch_6 Ah must have been the camera angles as it looked fine from where I was shooting. Actually I think those sitting in the main grandstand didn't get to see the last full power exit of the last corner. New series, so still lots to learn. 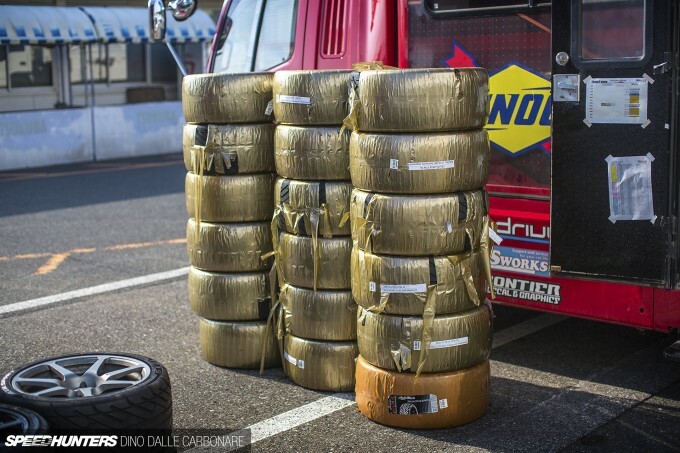 @speedhunters_dino it's the chase driver's responsibility to an extent. FD introduced the start chicane, as well as the restart cone, to prevent this exact sort of thing from happening. Although a good launch to be able to reach good entry speed is key, it is not part of the judged portion of the corse...it shouldnt happen that the winner is decided before the actual judged run even takes place. The lead driver's had way to much of an advantage. They got the inside, on the racing line (more rubber, more grip), And were then allowed to cut across the chase driver's line on the exit. The only guys who were able to maintain proximity were guys in really powerful, really grippy cars...and many of them were basically jumping the start in order to actually enter that first corner ahead of the lead driver. Best part is the Stagea 260rs hiding behind the Mercury Z33.